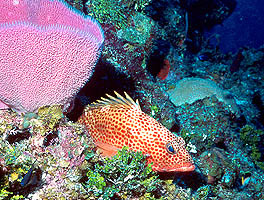 Danger waits for the unsuspecting reef fish that doesn't see this Red Hind lurking beneath a Pink Vase Sponge near Cayman Brac. Click here to see this predator up close. 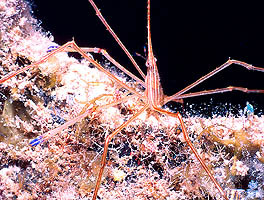 It is fun for scuba divers to explore shipwrecks at night. This Arrow Crab was doing a good business exploring the wreck of the Kissimmee, too, prowling for snacks just after sunset. Click here to read all about it.